The tiny island nation of Guam in the Pacific Ocean saw a sensational overhead kick, a marriage proposal and a booking in the space of a few seconds in the first game of 2017 in the country’s football Premier Division. At the GFA Center Lower Field in Harmon, the Budweiser Soccer League Premier Division league leaders Guam Shipyard were playing host to champions NAPA Rovers in the first game after the league’s Christmas break. It isn’t every day a footballer professes love for his better half on the pitch, as the high-testosterone atmosphere dictates he might become a figure of fun amongst his peers. However, in the 35th minute of this particular match, Rovers’ Ashton Surber buried an overhead kick into the top corner to put his side 3-0 up against Shipyard. He then wheeled away in customary celebration, racing towards the away fans while stripping off his shirt. Underneath he was wearing another shirt with the message: “MARRY ME?” – a proposal to his girlfriend in the stand, La’Kiesha Pereda. 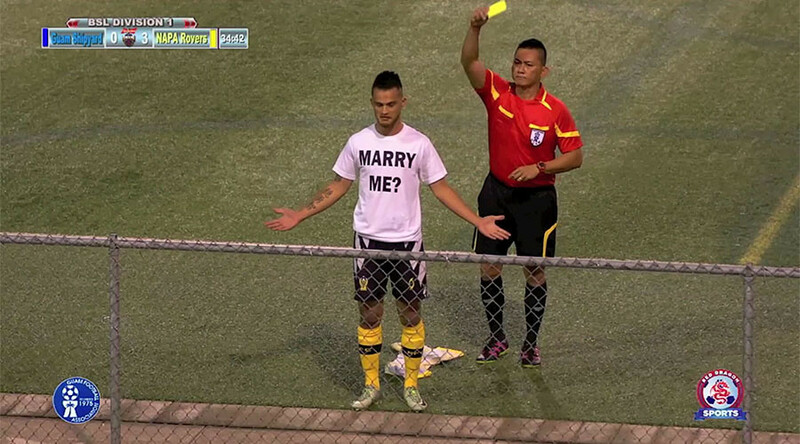 Despite unwittingly being in the midst of a moment of elation, the game’s over-zealous referee showed little tolerance for romantic gestures and promptly brandished a yellow card behind the head of Surber as he made his proposal, booking him for removing his shirt. Rules are rules, but Surber remained undeterred and sunk to one knee, blowing a kiss and pointing to his beloved in the crowd. Pereda said yes to put the icing on the cake of a 5-1 win for Rovers. The win took them to the top of the five-team Premier Division, ahead of Shipyard on goal difference.